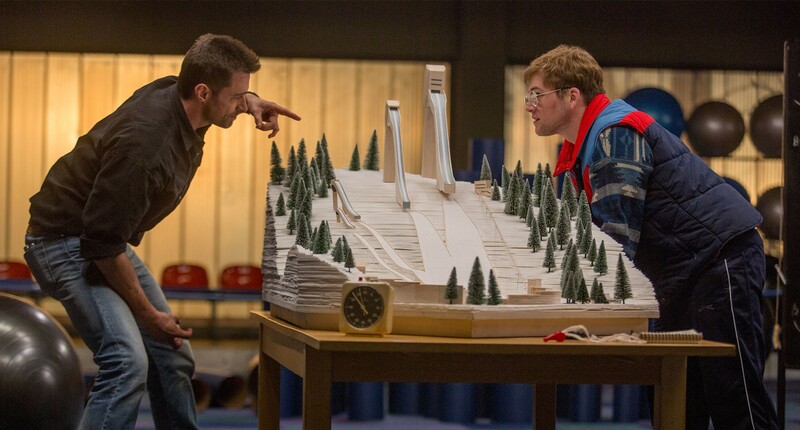 Plot – The true story of Eddie “The Eagle” Edwards (Edgerton) who against all the odds competed for England in the Ski Jump at the 1988 Winter Olympics and captured the hearts of a nation. A determined and likeable underdog, Eddie “the Eagle” Edwards captured the hearts and minds of Olympic fans in the late 1980’s with his never say die attitude and ability to play up to the crowd with larrikin antics, so it was always inevitable that someone would take this story and do a Cool Runnings like feel good job of it and this person just so happened to be actor turned director Dexter Fletcher. Fletcher has well and truly stuck to the rule book here with his take on Eddie the Eagle, it feels like a close cousin to Cool Runnings (which gets a sneaky look in on a radio broadcast in the film) and his added a cold hearted turned likeable coach to the mix with Hugh Jackman’s created for the film Bronson Peary but while Eddie the Eagle trudges along, ticking the necessary boxes this is a film that never really soars or invents its own character to come up trumps. Filmed almost as if it’s been cut straight from the 80’s with his era infused soundtrack and Adidas filled costumes, Fletcher handles the set pieces and danger of the sport well but Taron Edgerton’s incarnation of Eddie never fully feels like a good fit for the breakout star of Kingsman: The Secret Service and his performance is a major contributor to a film that feels like a mimicker rather than a film creating its own vibe. It’s amusing that in a film based on such outstanding true life moments and around such colourful characters that Hugh Jackman’s imaginary Peary comes across as the most interesting and fully formed even if his arc as a coach is anything but original. There’ll be a lot of fans of Eddie the Eagle (it’s IMDB rating attests to that) and it’s a film likely to be adored around this time of Olympics hype and love but you can’t help but escape the feeling that Fletcher’s film is a rather too generic look at a real life athlete that was anything but and while it’s nice for films to walk in the footprints of those successful stories of old, its often necessary that they look to ad their own flavour to proceedings which Eddie the Eagle fails to do. It’s not really the true story – do look at Wikipedia for a part of the actual events – but I still enjoyed it, more than you did. But I totally understand the reasons you wrote your good review and more people agree with you than would agree with me. Yeh I did notice a fair amount of this was pretty much not true ha. A shame I didn’t enjoy it more but maybe I’m getting a little grumpier with old age ha. The true story would have made for a much better movie. Tying to shoehorn everything into a classic “loser meets mentor” framework made it feel false. I get the feeling we might get another version of this tale down the line. Good review. I liked the movie. Its a tried and true “feel good movie” that sticks to a favorable formula. Yes, some events have been altered from the truth, but the end result is a good one. There’s no surprises in the film, but it just makes you feel good. I’m sure you’re not the only one that feels like that mate which is cool. I did want to like this a fair bit more than I did. Im sure youre not the only one Smiling! Sometimes movies like this can be the perfect medicine. Sadly when i watched this generic offering i wasnt much in need of a fix like this. I’ve had that experience a few times Peggy, wished I had had it here as well!